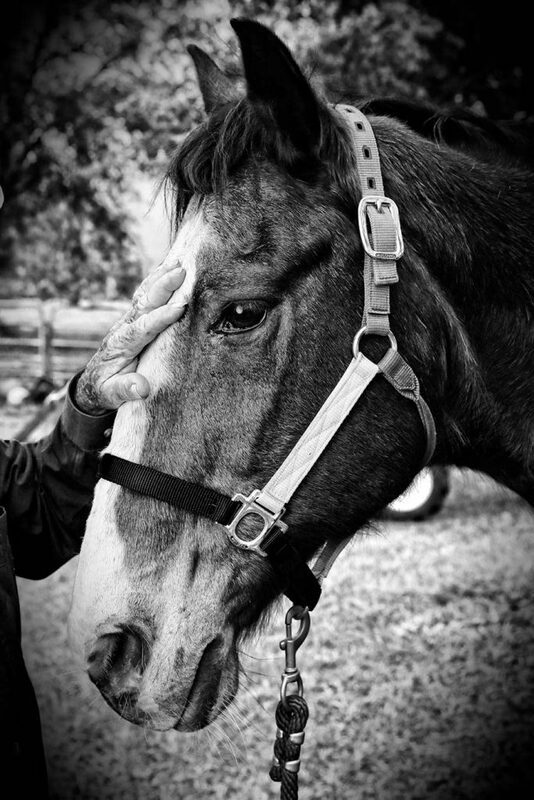 Veterans and children bond with rescue horses to rebuild their lives at a Groveland ranch. Every Sunday from 9-11am, military veterans and civilians are invited to the Veterans Multi-Purpose Center at the Circle B Ranch to learn how to help rescued horses reintegrate and heal from traumatic backgrounds of abuse and neglect. In turn, the ranch owners believe the experience is therapeutic for people. There is no charge to participate in the program at the ranch, 16540 Lake Stewart Drive in Groveland. “Recreation therapy is not about fun and games. It’s about living. Being out in the fresh air, being with others who have walked in his shoes,” says Bob Bambury, executive director and U.S. Navy veteran, who runs the charitable veterans support program with his wife, Marge. Their 15-acre recreational site also is home to their seven rescue horses—Trinity, Tigger, Peanut, Stoli, Cowboy, Red, and Slim—and the property is filled with an equine obstacle course and a small, picturesque lake. In addition to being a place for veterans to develop coping strategies, the ranch is a popular “go-to” place for children and adults served through LifeStream Behavioral Center to participate in equine therapy. LifeStream is the not-for-profit organization that provides a full array of behavioral health services in Central Florida. There are no medical forms, requirements, or the need for a doctor’s prescription to participate in the ranch activities. Recreational therapy is touted as a holistic health-care approach, and Bob says studies show participating in outdoor recreation programs can improve psychological well-being. Their free program includes equine-assisted activities; substance use disorder recovery and relapse prevention program; boating trips and sports fishing on a 24-foot pontoon boat; weekend retreats and camping for veterans and their families; picnic facilities with barbecue areas; educational classes on filing for service-connected disability compensation; and Sunday morning cowboy church. The Bamburys began working with veterans 27 years ago, focusing on those diagnosed with “chronic adjustment disorder,” which Bob says has become the Veterans Affairs’ preferred term for post-traumatic stress disorder. Noted as a debilitating condition, chronic adjustment disorder afflicts an estimated 7.7 million American adults, according to the National Institutes of Health. Among this population are those who acquired the disorder in combat. Veterans Affairs states the disorder affects 30 percent of Vietnam veterans, 10 percent of Gulf War veterans, 11 percent of Afghanistan veterans, and 20 percent of veterans returning from Iraq. Chronic adjustment disorder can cause disabling symptoms such as depression, difficulty sleeping or concentrating, crying spells, and anxiety. Bob believes the VA term of chronic adjustment disorder makes sense over PTSD. He feels people may have been misdiagnosed with PTSD, when the condition might have been a borderline disorder, bipolar, or something else. The Bamburys also provided transitional housing for homeless veterans in Fort Lauderdale for 15 years. “In doing that, I learned an awful lot about people, the psychology aspect of it,” Bob says, while Marge worked for the Miami Rescue Mission for 21 years. 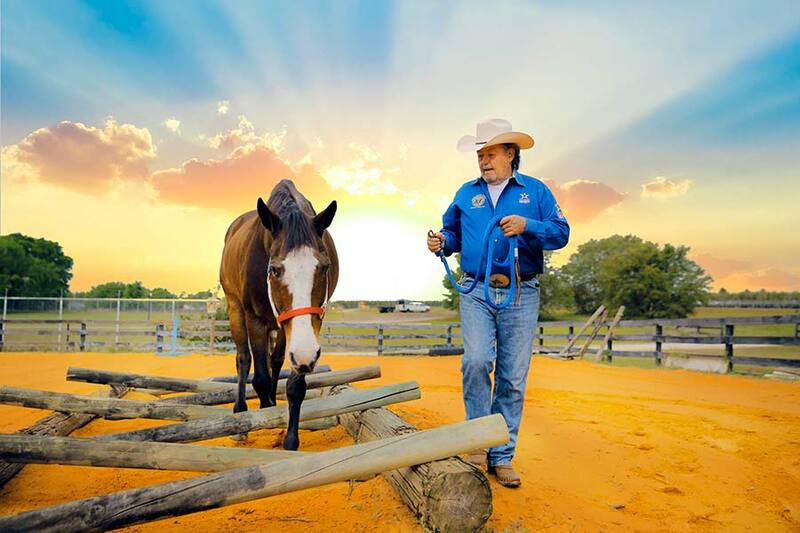 After the funding for the homeless program in Fort Lauderdale ended, the couple became interested in working with horses and wanted to observe the similarities of chronic adjustment disorder symptoms between horses and adults. They also wanted to offer a practical process to assist in the healing for both veterans and horses. He notes there is not one method that fits all traumatized veterans or one that is best for traumatized horses. He believes he has learned three important things a horse needs to be comfortable in its environment. In a therapy session, he says a veteran with chronic adjustment disorder can work with a horse experiencing similar conditions. “You take the vet who is so angry and put [him] with the horse who has the same symptoms, and we are going to work with that horse to get him to trust us. We are dealing with so much similarities,” he says. The couple believe events that traumatize humans are easy to understand, but that it may take some deeper understanding to realize what can be upsetting for a horse. Bob says what happens is the horse was adjusted to his former home and someone removed him from his setting, He was taken to a strange place and expected to be just fine. 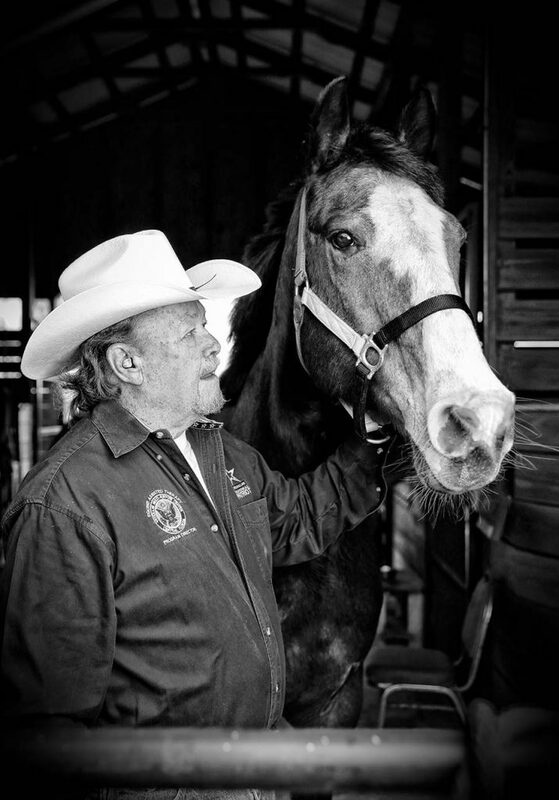 The Bamburys believe it’s easy to see similarities between traumatized horses and veterans, and they believe they understand horses since they have been around them for years. It all comes down to trust, he says. The Bamburys generate the trust with an obstacle course on their property. Soon, the horses follow the couple’s lead of walking on a bridge and performing other moves. The couple reward the horses with loving strokes on their neck, and they teach others how to do the same. In turn, displaying trust, the horses mimic some of the Bamburys’ actions to show they accept Bob or Marge as their leader. When Bob crosses one ankle over his other, his horse, Trinity, immediately follows and does the same. It’s easy to sense the horse’s trust. The Bamburys are devoted to working with horses, veterans, civilians, families, children, and all who can benefit from equine therapy. To learn more about the Veterans Multi-Purpose Center, visit vetsmpc.org or call 877.791.8603.